This apartment near the marina enjoys an ideal location to fully enjoy the pleasures of the French Riviera. At the foot of the city center, with its beautiful market under the hall, its historic district with its typical restaurants and shops and a few tens of meters from the train station, this fully furnished studio can accommodate 2 people, even 4 with a small supplement. Antibes also has many art galleries (painting, ceramics, etc. ), the Picasso Museum located inside the ancient walls, the Peynet Museum, Marineland, or the Napoleonic Museum among the places to discover. Its port is also known worldwide and hosts the most beautiful yachts in the region during the high season. Sandy beach at 700 m. Other sandy beaches 1,2 km served by shuttle. The air-conditioned apartment has a bathroom, a living room with kitchenette, a bedroom area with 2 real beds of a person. Beautiful terrace of 10 m 2, overlooking the patio. It offers the following facilities: TV, ceramic hob, Fridge, Microwave Oven, Dishwasher, Washing machine, Air conditioning, hairdryer, iron, kettle, etc. The apartment is also equipped with a wireless internet connection, allowing you to stay connected with ease. If you wish to visit the surrounding area or other sites of the French Riviera, Antibes train station takes you to Nice, Cannes, Saint Raphael in less than 30 minutes. No need to drive but still a small garage is available in the building. Building secure video surveillance of public areas, sworn guard. We stayed in this apartment for approximately 5 months. 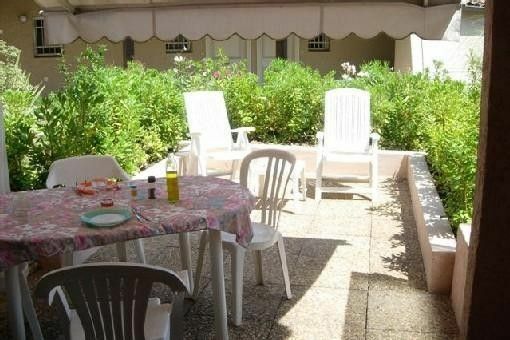 It has a great location, just steps from Antibes train station and the port. Old town is a nice 10 minute walk. The building is secure and very quiet. The only light into the apartment is through the sliding glass door. The apartment is equipped with everything you need to live comfortably including internet and wifi. The owner lives in Paris and has a gal who is quite lovely, manage the check-in an check-out process. She is also there for anything you need during your stay. Neither the owner or the manager speak English, but we were able to communicate well enough. A NOTE of CAUTION. We had only one real problem while we were there. About one month into our stay the key to the apartment got stuck in the lock. It would not come out of the lock and we tried everything. We called the manager and she came over right away. She couldn't get it out of the lock either, and she ended up taking the lock completely off the door. We had no way to secure the apartment if we went anywhere. She called the owner and he said we had to call a locksmith. Gerard said he would NOT pay for the locksmith that it was our responsibility. We called a locksmith and we were quoted eight hundred! The owner said he would not take responsibility for the cost. The CAUTION is if anything goes wrong with the place, no matter if it is your fault or not, you will have to pay for it!!!! We waited the weekend and went to a locksmith on Monday when they opened and purchased a new lock and keys and installed it ourselves for a lot less. We were never reimbursed for the cost. This renter had a special contrat because he stayed several months. I went to the apartment after the holiday and I noticed that the original lock worked perfectly. What is it happened? The real cost was 110 euros for troubleshooting according the contract and now everything is ok with the renter.